Since last two decades terrorist violence has been added on to the weapons for polarizing communities along religious lines. In Mumbai for example, we first witnessed the major blasts in the wake of 92-93 post demolition violence, then blasts in the aftermath of Gujarat carnage of 2002 and then 26/11 2008 attack from Kasab and company. This shows the multifaceted nature, many causative factors, of terrorist violence. In the similar vein, the country as a whole witnessed regular repeated violence with loss of lots of lives. In the all India chain of terror attacks, starting from attack on Sankat Mochan temple, Malegaon, blasts, Ajmer, Mecca masjid etc. so many incidents shook the country. The investigation of these attacks is another story mostly it has been guided by biases. Also since the investigation is mired in mystery, many a kite flying about the etiology, the causative factors and the identity of terrorists involved has become a routines story by now. Each commentator and political tendency riding on their own hobby horses as far as the identity of the personnel involved in acts of terror is concerned. 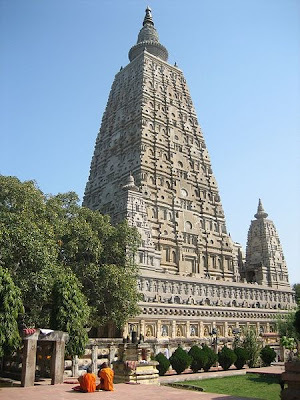 Nine blasts hit the Bodh Gaya holy shrine (8th July 2013). Fortunately the damage to lives was not there; only two monks incurred some injury. Immediately after the blasts the statement came that these blasts have been done by Indian Mujahidin operatives to take revenge of atrocities by Buddhists on Rohingya Muslims in Myanmar. This is by now a routine pattern that after every blast such statements have been made about involvement of some Pakistan based or group with Muslin identity and later some other truth, involvement of the ilk of Swami Aseemanand for example, has regularly emerged. There was a strong suspicion amongst those who have been following the acts of terror from critical angle that Bodh Gaya terror act might have something to do with Neetish Kumar walking out of NDA since Modi was appointed as the campaign committee chief by BJP for 2014 parliamentary elections. In an address to Bihar BJP workers Modi did talk of ‘teaching Neetish Kumar a lesson’. One knows that Modi is likely to be projected as the next Prime Ministerial candidate from the BJP side. As far as Indian Mujahideen, which is the first organization to be named by some investigation agencies and immediately lapped up by BJP family, is concerned many doubts have been raised about its role, its controllers and so on. Same way SIMI has been the major whipping horse so far, from the side of investigation agencies. SIMI was banned also. But when the ban was challenged, Justice Lata Mittal Tribunal found no reason to ban it. In popular perception this has been sunk deeply that SIMI is a terror outfit. The operatives of the type of Kasab have been different cup of poison, dancing to the tune of Pakistan army and Al Qaeda. Al Qaeda itself was a product of US policies to counter the Russian occupation in Afghanistan. This Al Qaeda impact on the investigation agencies had been so strong that the American media’s coining of the phrase ‘Islamic Terrorism’, in the wake of 9/11 WTC attack was converted into the dictum, ‘All Muslims are not terrorists but all terrorists are Muslims’ by communal forces and part of the media. This was the leading understanding of Indian investigation agencies in the wake of most of the terror blasts in India. Starting from the Nanded blast of April 2006 to the blasts in Malegaon, Mecca’s Masjid, Ajmer and Samjhauta Express, the same principle was applied by the biased investigation agencies and led to the arrests of hundreds of innocent Muslims ruining their careers for good and demonizing the community as a whole. This also led to the process, which is still on, fake encounters of Muslim youth, on different pretexts. BJP ruled Gujarat led the pack in this direction and youth like Ishrat Jahan were killed in cold blood; the alibi given was these terrorists, associated with Pakistan based terror groups have come to kill the Gujarat Chief Minister Narnedra Modi. Many a youth were done to death and lately with some investigations taking a proper direction, many a police officers, who are acolytes of Modi are currently cooling their heals in jails. Hemant Karkare played a very crucial role in partly reversing this trend, when during the course of Malegaon blast he could successfully catch the culprits, despite great opposition from the leaders of Hindutva stable, the likes of Bal Thackeray and Narendra Modi labeling Karkare as Deshdrohi (Anti National). In case of Bodh Gaya tragedy the association of this blast with Myanmar incidents seems to be a deliberate propaganda to polarize the communities. More so this is also aimed to pitch the Buddhists against Muslims. It has already been propagated loudly and section of media is making this as the base of their banner stories. From BJP camp, many of whose associates are currently in jail for allegedly being involved in acts of terror, Ravi Shankar Prasad said that “The media is saying that they (the perpetrators in the bakery case) had done recce of the temple at Bodh Gaya. There were warnings but no precaution was taken.” And that Bihar Government failed to take any preventing action. Here, there is a clear hint to link the blasts with Mynmar tragic events. In contrast Congress spokesperson Digvijaya Singh says that such statements are an attempt to polarize the communities and the non BJP Governments have to be more careful, more so Niteesh Kumar. It is true that BJP has in mind the forthcoming elections. By projecting Modi as the main contender to lead the party, it has already alienated many an allies. So it has to ensure that it should get more seats. It also knows that communal polarization is the best ladder for it to ascend to the seat of power. So far communal violence has been the major polarizing factor. As communal violence went up, the electoral strength of BJP also went up. With the rise of terrorist violence, BJP has also used terrorist violence to polarize the communities along religious lines, leading to further the good harvest in the electoral fields. Why can’t we wait till the investigations lead to some conclusions about ‘who did it’? The early speculations are fraught with dangers. Linking it up with atrocities on Rohingiya Muslims’ will further alienate them and make them more vulnerable. We have seen such speculations have tormented the Muslim community to no end in the wake of so many terror attacks in different parts of the country. One concedes that there has to be a working hypothesis in investigations. Such working hypothesis when biased and probably ‘non professional’ leads to the vulnerable sections being subjected to atrocities of the highest order. One major aspect which is being underplayed is the person Vinod Mistry, a carpenter, whose ID card and bag were found on the spot. In the bag was the robe of a Buddhist monk. What is the inference of this? Rihai Manch a Forum for release of innocent Muslims in jails on the charges of terror attacks, points out "the manner in which one finds mention of a name called Vinod Mistry in this case and the way in which we are finding that clothes normally worn by Buddhist monks were discovered from his possession and the manner in which letters in Urdu were discovered from the temple, it rather vindicates that it was an attempt to stage 'Malegaon' in Bodhgaya where fake beard was found out and where due to wrong/biased inputs many innocent Muslims were lodged in jail for quite some time till real culprits belonging to RSS were discovered"
In Indian political chessboard, the organizations taking inspiration from the ‘Hindu nation’ ideology; have been at the forefront in so many acts of terror, Swami Aseemanand, Swami Dayanand, Sadhvi Pragya Singh Thakur and company. The mistaken hypothesis, ‘All Terrorists are Muslims’ kept protecting them and deflecting the line to investigation in wrong directions. What is needed is an unbiased objective approach. While it is unfortunate that the holy place associated with Lord Gautama Buddha has been targeted, one also feels that a professional unbiased investigation should be undertaken and guilty punished. What is also needed that the baseless linking of this terror attack to Rohingya Muslims be shunned till the investigations reveal something substantive. The quality of pictures from the CCTV cameras is pathetic and I doubt anything could be gleaned from their footage. I also wonder just how rigorous the recordings are. Detection and capture of the culprits requires good data obtained from an effective CCTV network and "espionage". In the absence of this, I doubt the NIA can identify/capture the terrorists. A lesson learnt from which we should start making the CCTV networks at sensitive sites more effective. That's true. Effective CCTV footage would have enormously helped identifying the culprits. And, it would have thwarted attempts by vested interests spreading unsubstantiated stories before they have the evidence. As the legendary fictional character Sherlock Holmes said, "It is a capital mistake to theorize before you have all the evidence"